School of Chemical Sciences, Kannur University, Payyanur Campus, Kannur - 670327, Kerala, India. ABSTRACT: Plants have been used in traditional medicine for several thousand years since which may have been described to have curative value. Terminalia chebula (TC), Terminalia arjuna (TA) and Holarrhena antidysenterica (HA) are very important medicinal plants in the traditional Indian systems of Ayurveda and Siddha. In this work, fruit of Terminalia chebula, bark of Terminalia arjuna and Holarrhena antidysenterica were selected for experiments. 80% methanolic crude extracts of these plants were fractionated by diethyl ether and ethyl acetate. Diethyl ether fraction of 80% methanolic extract (DM) and ethyl acetate fraction of 80% methanolic extract (EM) of all the three plants were compared for their phyto-chemical, antioxidant and cytotoxicity to find out their therapeutic potential. The phenolic content was determined by Folin-Ciocalteu method and was found to be higher in Terminalia chebula extracts (>36 mg GAE/g)). The antioxidant activity was assayed through some in-vitro methods such as DPPH radical scavenging assay, phosphomolybdenum method and reducing power assay. Antioxidant activity was also found to be highest in Terminalia chebula extracts. Cytotoxicity of extracts was determined by the MTT assay using HeLa cell lines which showed that the increase in concentration of the extract increases the cell death. All the extracts showed moderate cytotoxicity with IC50 values ranging from 147.91 to 1701 µg/ml. These findings showed that extracts from Terminalia chebula is a potential source of natural antioxidants and could be good alternatives to synthetic antioxidants in pharmaceutical industries. INTRODUCTION: Plants such as fruits, vegetables, herbs, spices etc. are part of human society from ancient time, since they have been used to cure many diseases. They have been considered as cheap source of phytochemicals which are used in the synthesis of drugs against various illnesses. Even though highly effective synthetic drugs are easily available in curing diseases, there are a lot of people who prefer traditional herbal medicines since they are less harmful to human body 1. Phytochemicals such as alkaloid, terpenes, saponines, quinones and polyphenols are natural and non- nutrient chemicals, synthesised exclusively by plants that act as protective agents against external stress and pathogenic attack 2. Phytochemicals could also exhibit other bio-activities such as antimutagenic, anticarcinogenic, antioxidant, antimicrobial, anti-inflammatory and antibacterial properties 3. Natural products have beneficial effects on human health because of their ability to scavenge free radicals originating from different oxygen (ROS) and nitrogen species (RNS). These Reactive Oxygen Species are produced in living cells as a result of normal cell metabolism but their overproduction can affect and damage essential biomolecules such as nucleic acids, lipids, proteins if not eliminated quickly 4. All organisms have antioxidant defenses, including antioxidant enzymes and antioxidant dietary components, to remove or repair damaged molecules 5, 6. If ROS are not removed by such constituents, they may lead to many chronic diseases, such as cancer and cardiovascular diseases 7. Natural antioxidants have been studied extensively since they can protect cells from such oxidative damage and are assumed to be less toxic than synthetic antioxidants, such as butylated hydroxyanisole (BHA) and butylated hydroxyl-toluene (BHT). However, they have been reported to cause liver damage and cancer 8. In the present study, three medicinal plants viz. fruit of Terminalia chebula, bark of Terminalia arjuna and bark of Holarrhena antidysenterica were selected. These plants are a common household remedy against a variety of disorders. Terminalia chebula is a popular folk medicine belongs to Combretaceae family. This fruit is one of the major active constituent of Triphala. Terminalia chebula is commonly used for the treatment of several ailments like constipation, parasites, urinary disorders, tumors, skin diseases, paralyse and skin disease 9. The fruit has been traditionally used for treating diseases related to digestion, coronary disorders cough and skin disorders 10. The fruit is used as a cardiotonic and is well known to cure asthma, sore throat, vomiting and bleeding 11. Fruits are also reported to have antioxidant, antibacterial, anti-inflammatory and cytoprotective activity 12. Terminalia arjuna, commonly known as arjuna belongs to Combretaceae family is recommend by Ayurvedic physicians in the treatment of three types of doshas Vata, Pitta and Kapha 13. Bark is found to have antioxidant, anti mutagenic, hypolipidemic and cardio protective activity 14. It is reported that dried bark powder of Terminalia arjuna has protective effects in ischemic heart disease 15. Holarrhena antidysenterica is a deciduous tree of the Apocynaceae family, has been traditionally used for the treatment of dysentery 16. The stem bark of this plant, commonly known as kurchi, is used as a tonic in diseases of the skin, immunomodulating agent and larval growth 17. The bark and seeds are also used for treatment of diarrhoea, asthma, broncho-pneumonia and malaria 18. The objective of this study was to determine the total phenolic, flavonoid contents, antioxidant activities (by DPPH, Total antioxidant and FRAP) and cytotoxic evaluation of these medicinal plants. Collection of Plant Materials and Extraction: Fresh fruit of Terminalia chebula, bark of Terminalia arjuna and bark of Holarrhena antidysenterica were collected from the local market of Kannur district of Kerala, India and were taxonomically identified by Dr. Sujanapal P, Scientist, Kerala Forest Research Institute (KFRI), Thrissur. The Plant materials were thoroughly washed with water, air dried in the dark and grounded to a powder form. 80% methanolic extracts were prepared by Soxhlet extraction method. The extracts were washed with petroleum ether to remove fatty matter. The filtrate was then partitioned with diethyl ether and ethyl acetate. Both the fractions collected were dried in a fume hood and were stored in a dessicator. Determination of Total Phenolic Content: The content of total phenolic compounds in extracts was determined by the Folin-Ciocalteu’s (FC) reagent using gallic acid as standard 19. 0.5 ml of each sample (1 mg/ml) in methanol was mixed with 2.5 ml of Folin-Ciocalteu reagent (1:10 with water) and 2 ml of sodium carbonate solution (7.5%, w/v). The mixture was incubated at 30 oC for 90 min. The absorbance of the resulting blue-coloured solution was measured at 765 nm using Shimadzu UV-1700 Spectrophotometer. The total phenolic content was expressed as mg of gallic acid equivalents/g of extract (GAEs). Determination of Flavonoid Content: Colori-metric aluminum chloride method was used for flavonoid determination 20. Briefly, 0.5 ml solution of each extracts in methanol were separatly mixed with 1.5 ml of methanol, 0.1 ml of 10% aluminium chloride, 0.1 ml of 1M potassium acetate and 2.8 ml of distilled water. After incubation at room temperature for 30 min, the absorbance of the reaction mixture was measured at 415 nm with a Shimadzu UV-1700 spectrophotometer. Measure-ments were done in triplicates. Total flavonoid contents were calculated as quercetin equivalents from a calibration curve. The calibration curve was prepared by preparing quercetin solutions at concentrations 25 to 100 μg/ml. Where, A0 is the absorbance of the control and A1 is the absorbance of the sample/standard. The assays were carried out in triplicate and the results were expressed as mean values ± standard deviations. The extract concentration providing 50% inhibition (EC50) was calculated from the graph of RSA percentage against extract concentration. Ascorbic acid was used as standard. Lower absorbance of the reaction mixture indicated higher free radical scavenging activity. Total Antioxidant Assay: The antioxidant activity of the extracts was evaluated by the phospho-molybdenum method 22. The assay is based on the reduction of Mo(VI) - Mo(V) by the extract and subsequent formation of a green phosphate/Mo(V) complex at acid pH. Various concentrations of extracts in methanol were combined with 3ml of reagent solution (0.6 M sulfuric acid, 28 mM sodium phosphate and 4 mM ammonium molybdate). The tubes were incubated at 95 °C for 90 min. After the mixture had cooled to room temperature, the absorbance of the solution was measured at 695 nm against a blank. The antioxidant activity was expressed as the number of equivalents of ascorbic acid. Reducing Power Assay: The reducing power of methanolic extracts was determined spectrophoto-metric method 23. Different amounts of methanolic extracts (20 - 100 µg/ml) in methanol were mixed with 2.5ml phosphate buffer (0.2 M, pH 6.6) and 2.5 ml potassium ferricyanide (1%). The mixture was incubated at 50 ºC for 20 min. 2.5 ml of trichloroacetic acid (10%) was added to the mixture and centrifuged at 3000 rpm for 10 min. The supernatent solution (2.5 ml) was mixed with distilled water (2.5 ml) and FeCl3 (0.5 ml, 0.1%), and the absorbance was measured at 700 nm. Increased absorbance of the reaction mixture indicated increased reducing power. Description of Cell Lines: HeLa cell lines were purchased from National Centre for Cell Sciences (NCCS), Pune. The cells were cultured in Dulbecco’s Modified Eagle Media (DMEM) supplemented with 1% (v/v) Kanamycin and 10% (v/v) heat inactivated FBS. Cells were maintained in 5% CO2 humidified incubator at 37 ºC. During subculture, cells were detached by trypsinization when they reached 80% confluency. The well-grown cells were harvested and seeded into 96-well plates at a density of 2000 cells per well for the experiments. Cytotoxicity Assessment by MTT Assay: Cell viability was tested using MTT assay 24 which was based on the cleavage of the tetrazolium salt (MTT) by metabolically active cells to form a formazan dye that was water-insoluble. The insoluble dye formed in MTT assay was solubilized using DMSO. Cells were seeded in separate 96-well tissue culture and incubated overnight at 37 °C and 5% CO2, then morphology of cells were observed in invert microscope. After overnight growth, supernatants in the culture plates were aspirated out and then the cells were treated with extracts at different concentrations. Treated cells were incubated for 24 h at 37 °C and 5% CO2. Morphology of the cells was observed using invert microscope. Then 10 μL MTT solution (5 mg/ ml) was added to each well and the plates were incubated for 4 h. Supernatants were removed and the crystals formed were dissolved in 100 μL DMSO and then absorbance at 570 nm was measured using a microwell plate reader. All absorbance values were corrected against blank wells which contained growth media alone. All experiments were carried out in triplicates, independently. Total Phenolic and Flavonoid Contents: The total phenolic and flavonoid contents in the examined plant extracts are shown in Table 1. The total phenolic contents in the examined extracts ranged from 4.6 mg GAE/g for the EM of Terminalia arjuna to 74.6 mg GAE/g for DM of Terminalia chebula. Flavonoid contents in the extracts ranged from 4 mg QE/g for DM of Terminalia arjuna to 13 mg QE/g for EM of Terminalia chebula. The higher phenolic content was measured in diethyl ether fractions compared to ethyl acetate fractions. The total phenolic contents in plant extracts depend on the polarity of solvent used in extraction. High solubility of phenols in polar solvents provides high concentration of phenolics in diethyl ether fractions in all the plants 25. Also it is clear from the data that among all the three plants Terminalia arjuna contains less phenolics and flavonoids. Although this plant is not rich in phenolic compounds, as shown by the low total phenolic content, it may contain other phytochemicals. 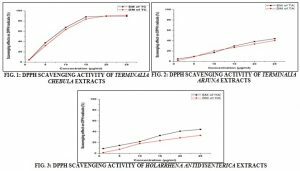 DPPH Radical Scavenging Activity: The Radical Scavenging activity values of ethyl acetate and diethyl ether extracts from Terminalia chebula, Terminalia arjuna and Holarrhena antidysenterica were examined and compared against one another Fig. 1, 2 and 3. From the analysis of Fig. 1, 2 and 3, we can conclude that the scavenging effects of ethyl acetate and diethyl ether extracts on DPPH radicals increased with the concentration increase and were highest (89.47% and 91.35% at 25 µg/ml respectively) for Terminalia chebula. Extracts from Holarrhena antidysenterica and Terminalia arjuna presented moderate RSA values (33.33% - 44.32% at 25 µg/ml). However, the scavenging effect of standard Ascorbic acid (25 µg/ml) was 92.10%. It was found that radical scavenging effects of extracts were directly proportional to the phenolic content present in the extracts. EC50 value was determined from the plotted graph of scavenging activity against various concentrations of extracts. Out of all extracts, Terminalia chebula extracts showed the lowest EC50 (8.99 and 9.69 µg/ml for ethyl acetate and diethyl ether fraction respectively). The lowest EC50 indicates the strongest ability of the extracts to act as DPPH radical scavengers. Reducing Power Assay: Fig. 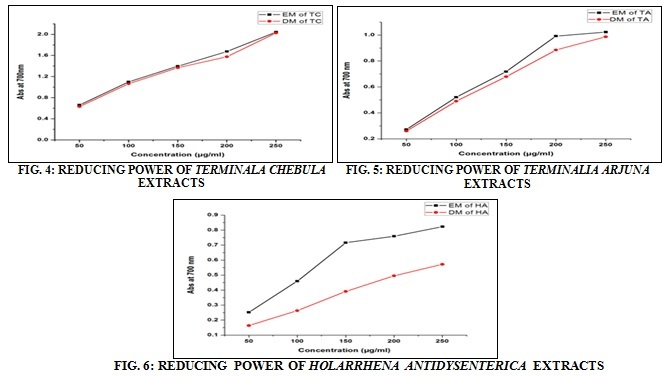 4, 5 and 6 show the reducing power of extracts of Terminalia chebula, Terminalia arjuna and Holarrhena antidysenterica as a function of their concentration. In this assay, the yellow colour of the test solution changes to various shades of green and blue, depending on the reducing power of each compound. The presence of antioxidants (reductance) in the sample would result in the reducing of Fe3+ to Fe2+ by donating an electron. Therefore, measuring the formation of Perl’s Prussian blue at 700 nm can monitor the Fe2+concentration. The reducing power of the extracts increased with increase in extract concentrations. This may be served as a significant indicator of its potent antioxidant activity. At 250 µg/ml the reducing power was higher than 0.57 and in the order EM of Terminalia chebula > DM of Terminalia chebula > EM of Terminalia arjuna > DM of Terminalia arjuna > EM of Holarrhena antidysenterica > DM of Holarrhena antidysenterica. However, the reducing power of ascorbic acid was relatively more pronounced than that of sample extracts. The extracts obtained from Holarrhena antidysenterica showed comparatively lowest reducing power values. The extracts isolated from Terminalia chebula proved to be a better source of antioxidants than extracts from other plants. In Table 2, we present the EC50 values for reducing power and DPPH scavenging effects obtained from each plant extracts. Overall, Terminalia chebula (lower EC50 values) revealed better antioxidant properties than Terminalia arjuna and Holarrhena antidysenterica, which is in agreement with the higher content of phenols found in the first species. This was much more evident in EC50 values for DPPH scavenging effect (10 > µg/ml for Terminalia chebula versus >25 µg/ml for other two species). Paixao et al., 26 reported a significant correlation between total phenolics and scavenging activity. 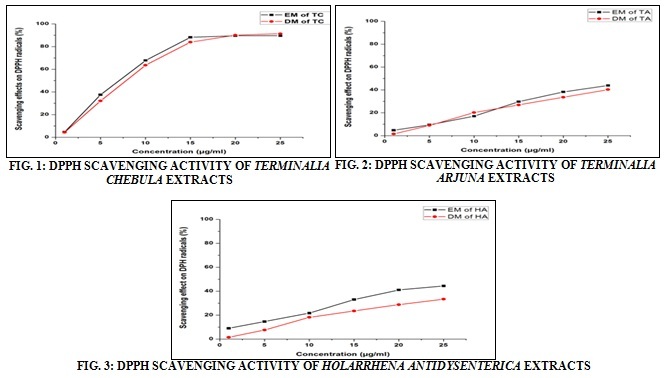 Our study revealed that Terminalia chebula extracts exhibited high content of phenolic compounds which was significantly correlated with the DPPH radical scavenging activity. Total Antioxidant Capacity: The total antioxidant activity of all the six fractions was shown in Table 3. The total antioxidant activity was evaluated by using phosphomolybdate method. This assay is based on the reduction of Mo(VI) to Mo(V) in presence of the antioxidant compounds and the subsequent formation of a green phosphate/Mo(V) complex at acidic pH, which is measured at 695 nm. It is a quantitative one, since the antioxidant activity is expressed as the number of equivalent of ascorbic acid (mg/g plant extract). aEC50 (µg/ml): Effective concentration at which the absorbance is 0.5. bEC50 (µg/ml): Effective concentration at which 50% of DPPH radicals are scavenged. 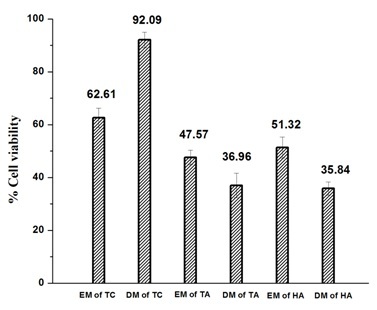 Table 3 showed that the diethyl ether and ethyl acetate fraction of Terminalia chebula show the higher antioxidant capacity (918.4 and 892.8 mg ascorbic acid equivalent/g dry extract respectively). The other four species which showed antioxidant capacity in the order: DM of Holarrhena anti-dysenterica (587), EM of Holarrhena anti-dysenterica (552.8), DM of Terminalia arjuna (508.4) and EM of Terminalia arjuna (368). All the extracts showed an increase in antioxidant capacity with an increase in dose. This good antioxidant activity might be attributed to the presence of high amounts of polyphenols in these extracts. Cytotoxicity Study: The cytotoxic activity of all the six extracts was determined by MTT assay. The effect of extracts (250 μg/ml) on viability of HeLa cell line was shown in Fig. 7. Each bar represents mean± SD of triplicate study. Cytotoxicity study showed that all the extracts significantly increased the percentage of viability of HeLa cell lines. All the extracts showed moderate cytotoxic effect even at high concentration (250 μg/ml). IC50 values were calculated and shown in Table 4. In-vitro cytotoxicity test using HeLa cell lines was performed to screen potentially toxic compounds that affect basic cellular functions and morphology. MTT assay is based on the reduction of MTT by mitochondrial dehydrogenase by purple formazan product. Among the six extracts, diethyl ether and ethyl acetate extracts from Terminalia chebula have shown least cytotoxicity on cancer cell line (IC50 values 1701 and 340.12 µg/ml respectively). 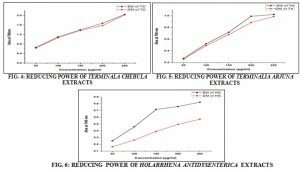 Terminalia arjuna and Holarrhena antidysenterica extracts have shown moderate cytotoxicity on Hela cell lines. CONCLUSION: Among the three studied plants, Terminalia chebula is found to be rich in phenolics and flavonoids. Presence of phenolic compound and its congers might be the reason behind its highest antioxidant potential. All the extracts showed moderate cytototoxicity and cells were viable even at higher concentrations. Further studies are needed to determine their exact chemical composition and mechanism of action. ACKNOWLEDGEMENT: The authors are thankful for the financial support provided by the Council of Scientific and Industrial Research, India. We are also thankful to Miss Lincy Edatt, Central University of Kerala, Kerala, India for the service provided for cell line studies. CONFLICT OF INTEREST: Authors declare that they have no conflict of interest. Iqbal E, Salim KA and Lim LBL: Phytochemical screening, total phenolics and antioxidant activities of bark and leaf extracts of velutinus(Airy Shaw) from Brunei Darussalam. Journal of King Saud University-Science 2015; 27: 224-32. Anbumalarmathi J, Aruna Sharmili S and Esther S: Fenugreek (Trigonella foenum-gracecum): Antibacterial activity of its phytochemical constituents. International Jou of Ayurvedic and Herbal Medicine 2016; 6: 2166-71. Ahmed SI, Hayat MQ, Tahir M, Mansoor Q, Ismail M, Keck K and Bates RB: Pharmacologically active flavonoids from the anticancer, antioxidant and antimicrobial extracts of Cassia angustifolia BMC Complementary and Alternative Med 2016; 16: 460-9. Diaz P, Jeong SC, Lee S, Khoo C and Koyyalamudi SR: Antioxidant and anti-inflammatory activities of selected medicinal plants and fungi containing phenolic and flavonoid compounds. Chinese Medicine 2012; 7: 1-9. Ratnam DV, Ankola DD, Bhardwaj V, Sahana DK and Kumar MR: Role of antioxidants in prophylaxis and therapy: A pharmaceutical perspective. Journal of Controlled Re-lease 2006; 113: 189-207. Ak T and Gulcin I: Antioxidant and radical scavenging properties of curcumin. Chemico-biological Interactions 2008; 174: 27-37. Ismail A, Marjan ZM and Foong CW: Total antioxidant activity and phenolic content in selected vegetables. Food Che-mistry 2004; 87: 581-6. Kasangana PB, Haddad PS and Stevanovic T: Study of polyphenol content and antioxidant capacity of arboreus (Cecropiaceae) root bark extracts. Antioxidants 2015; 4: 410-26. Venkatesan A, Kathirvel A, Prakash S and Sujatha V: Antioxidant, antibacterial activities and identification of bioactive compounds from Terminalia chebula bark extracts. Free Radicals and Antioxidants 2017; 7: 43-9. Srisesharam S and Indira AJ: Effect of Terminalia chebula Retz on den induced hepatocellular carcinogenesis in experimental rats. International Journal of Pharmacy and Pharmaceutical Sciences 2012; 4: 440-5. Jinukuti MG and Giri A: Antimicrobial activity of aqueous extract of Terminalia chebula Recent Research in Science and Technology 2013; 5: 46-9. Saha S and Verma RJ: Antioxidant activities of polyphenolic extract of Terminalia chebula Retzius fruits. Journal of Taibah University for Science 2016; 10: 805-12. Gupta D and Kumar M: Evaluation of in-vitro antimicrobial potential and GC-MS analysis of sinensis and T. arjuna. Biotechnology Reports 2017; 13: 19-25. Subramaniam S, Subramaniam R, Rajapandian S, Uthrapathi S, Gnanamanickam VR and Dubey GP: Anti-atherogenic activity of ethanolic fraction of Terminalia arjuna bark on hypercholesterolemic rabbits. Evidence-Based Complementary and Alternative Med 2011; 1-8. Asha S and Taju G: Cardioprotective effect of Terminalia arjuna on Caffeine induced coronary heart disease. International Journal of Pharmaceutical Sciences and Research 2012; 3: 150-3. Sathyanarayana B and Ravishanker B: An experimental study of “Kutajarishta” (An Ayurvedic Herbal Formulation) for its action on Intestinal motility. International Journal of Research in Ayurveda and Pharmacy 2015; 6: 616-20. Khan S, Khan H, Shah MAR, Khan FU, Shahnaz and Khan RU: Phytotoxic, antioxidant and cytotoxic effect of Holarrhena antidysenterica seeds extracts. International Journal of Advanced Research 2013; 8: 28-33. 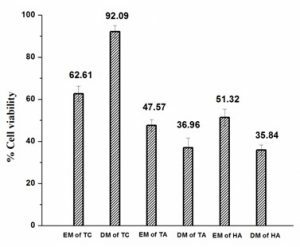 Sharma DK, Gupta VK, Kumar S, Joshi V, Mandal RS, Prakash AB and Singh M: Evaluation of antidiarrheal activity of ethanolic extract of Holarrhena antidysenterica seeds in rats. Veterinary World 2015; 8: 1392-5. Borkataky M: Antioxidant activity, total phenolic content and total flavonoid content of Perilla ocymoides Der Pharmacia Lettre 2015; 7: 69-72. Bhaigyabati T, Devi PG and Bag GC: Total flavonoid content and antioxidant activity of aqueous rhizome extract of three Hedychium species of Manipur Valley. Research Journal of Pharmaceutical, Biological and Chemical Sciences 2014; 5: 970-6. Aliyu AB, Ibrahim MA, Musa AM, Musa AO, Kiplimo JJ and Oyewale AO: Free radical scavenging and total antioxidant capacity of root extracts of Anchomanes difformis (Araceae). Acta Poloniae Pharmaeutica 2013; 70: 115-21. El-Jemli M, Kamal R, Marmouzi I, Zerrouki A, Cherrah Y and Alaoui K: Radical-scavenging activity and ferric reducing ability of Juniperus thurifera (Linn. ), oxycedrus (Linn. ), J. phoenicea (Linn.) and T. articulata (Linn.). Advances in pharmacological sciences 2016; 1-6. Joby J, Dhanya AT, Haridas KR, Sumesh KTM, Sony J, Jayadevi VE and Sudheesh S: Structural characterization of a novel derivative of myricetin from Mimosa pudica as an anti-proliferative agent for the treatment of cancer. Biomedicine and Pharmacotherapy 2016; 84: 1067-77. Mohsen MS and Ammar SMA. Total phenolic contents and antioxidant activity of corn tassel extracts. Food Chemistry 2008; 112: 595-8. Paixao N, Perestrelo R, Marques JC and Camara JS: Relationship between antioxidant capacity and total phenolic content of red, rose and white wines. Food Chemistry 2007; 105: 204-14. Soumya K, Jesna J and Sudheesh S: Screening study of three medicinal plants for their antioxidant and cytotoxic activity. Int J Pharm Sci & Res 2018; 9(9): 3781-87. doi: 10.13040/IJPSR.0975-8232.9(9).3781-87.